How I Managed to Give the Massive Gurgaon Traffic Jam a Miss! I called home before boarding my flight at Dehradoon. It was July 28, 2016. My husband said there has been a heavy shower in Gurgaon and the likelihood was strong that I would get stuck in a traffic jam. At least my flight was on time. Little did I know that the massive Gurgaon Traffic Jam would be waiting for me! When the aircraft was about to land at T3, I clicked the picture of NH 8 and it didn’t look good at all. After I got my baggage from the belt, I clicked the OLA App and to my surprise there was not a single taxi of any category available at T3. That was a first! Normally there is hardly a one minute wait and you get all kinds of taxis easily. When I came out the Meru and Mega taxi queues were going back into the terminal. Now I had two options- to stand in the loooooooooooong Meru Cab line or to take the metro. However if I took the metro to Gurgaon, someone would have to pick me up from the metro station because it was getting late at night. Once again I called home and told them there were no taxis at T3. Then the debate started- whether I should try to come to Gurgaon or should I go to my sister’s place in Ghaziabad? I was confused for about a span of five minutes. When I called my sisters she happily said that she would pick me up from the metro station if I decided to head her way. The minute my nephew (also known as Brat 2) told me it took him 3 hours to come home from work, I decided I would go to my sister’s place. The Airport Express Line was the Savior! I took the airport metro line to Dwarka Sector 21 and then the blue line to my sister’s place. The metro was not crowded at all. Only at Rajiv Chowk the ladies’ coach got full. It emptied out again much before my stop. I had started from Landour, and on top of that I have to take avomine because I have motion sickness on the mountain roads. After I sat beside my sister in her car, I was happy, I could finally relax and leave the thinking to her. We reached home quickly and I was good to be at home. It was only after I started looking at the Facebook updates of friends who stay in Gurgaon, I realized what a massive traffic jam it was! I was lucky I escaped it by taking the metro and giving Gurgaon a miss altogether. How I wish we would improve our infrastructure. How I wish we were not prone to such massive water logging. In fact while I was working I never enjoyed the rainy season, it is only after quitting my job I have started enjoying the rains. Earlier rains were synonymous with traffic jams. Now at least I have an option of giving them a miss! 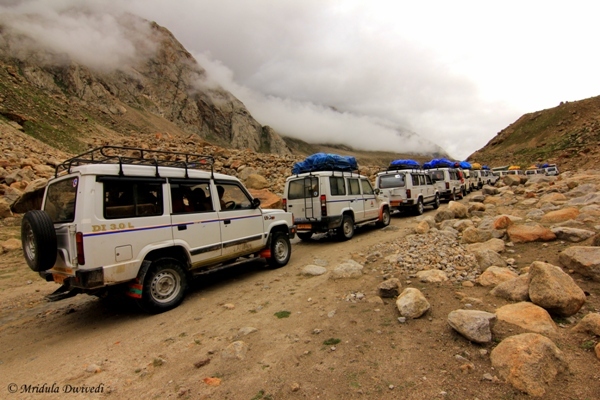 The first time I passed through the Rohtang pass (a little more than 50 km away from Manali) it was on my way to Leh. We had started at 2 am from Manali and when we reached the Rohtang Pass, an hour or two later, the place was bewitchingly beautiful. As far as the eye could see, there was snow and silence. A narrow road passed through it and I thought I would like to visit it on its own. It is anyway a very popular tourist spot. I never realized the beauty lied in being there at the off-peak hours! 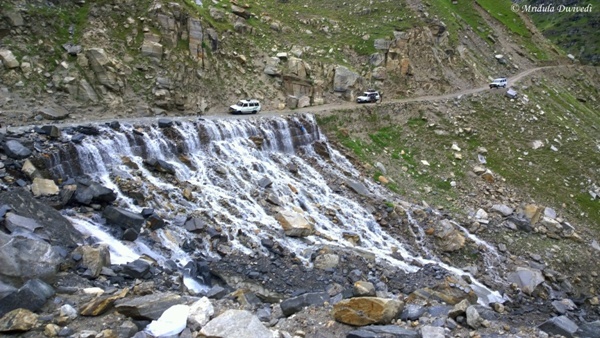 I passed through the Rohtang Pass again while coming back from Leh. This time it was 11.00 am in the morning and I just could not recognize the place. As far as the eye could see there were vehicles parked all over the place and temporary tents selling food have sprung up everywhere. The Pass was crowded and as we Indians litter like maniacs, the place was dirty beyond recognition. The views in the distance were still as beautiful but I am not sure that I would enjoy it much if it was a stand alone visit. It also did not help at all that we sat in a traffic jam for hours. 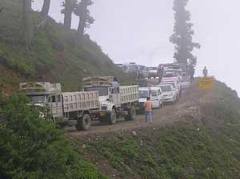 As the roads are narrow even a little bit of indiscipline can cause a long traffic jam on the mountain roads. 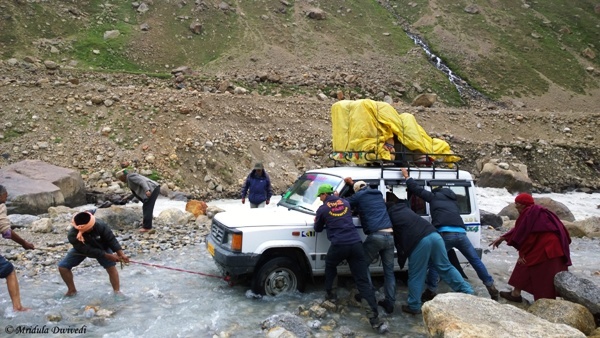 As we were coming for Leh which is a very long and arduous journey with one night break in Keylong, all I wanted to reach Manali early and crash! But we had no such luck, the jam cleared only after a long time. I arrived in Manali completely tired and quite underwhelmed with the Rohtang Pass. I would say the real trips start after you leave Rohtang Pass behind!